We asked parents in our Q Wunder Ambassadors Facebook group what their biggest Halloween pet peeves are — and they had plenty! 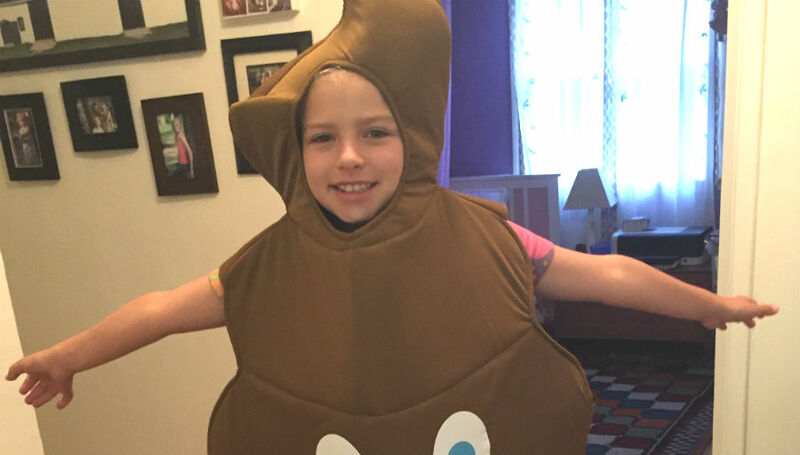 Holidays like Halloween are a great chance for families to bond and create precious memories of that time your kid dressed up as a poop emoji. But they’re also an important opportunity to teach and model kindness, manners and considerate behavior — hopefully they’ll remember that forever too! Don’t trick-or-treat too early or too late. “My biggest pet peeve is parents bringing their kids around before the start time,” says Rachel Johnston, mom to a 10-year-old girl. “In our county, we have specific times, like 5 to 7 PM. I don’t like to not have the stuff out for the kiddos when they ring the bell.” Many cities and/or neighborhoods have start and end times — Google where you live to see if yours does. If not, a good rule of thumb is to head out at sunset and head home by 8 PM. Otherwise, you may disturb families who are having dinner, sleeping or otherwise occupied. Don’t let your kids just stand there staring. “‘Trick or treat’ and ‘thank you’ are quick and easy to say!” notes Jillian Davis, mom to a 5-year-old boy. Granted, kids can get excited and forget, but it’s your job to refresh their memory before they start trick-or-treating and prompt them on the doorstep if they forget. Plus: Remind them to respond politely when they’re asked about their costume (bonus points for doing a practice run before you leave). Please, begs Melissa Bechtel, mom to 4-, 9- and 11-year-old girls and a 13-year-old boy, “no plastic blood-flowing masks like the Scream one. They’re too much for little ones — and for me!” In fact, costumes featuring blood and gore are best avoided altogether. Even if your kids can handle it, what about the two-year-old bumblebee who toddles up to the doorstep to trick-or-treat next to them? Don’t skip the costume either. It bugs Laura Johnson Wurzer, mom to 10- and 14-year-old boys, “when older kids don’t even bother trying to wear a costume.” Neighbors are giving your kids candy; the least you can do is dress them up. Even older kids who might be over it (but still want chocolate) can throw an old sheet with a couple of holes in it over their head. Don’t hit the same house twice. “At least put forth some effort,” sighs Laura. No matter how good the candy is or how “on the way home anyway” it is. Don’t make your baby trick-or-treat. Andy Tunnicliffe, dad to 6- and 8-year-old boys, hates it “when adults hold a baby and expect candy in their bag. Obviously the baby shouldn’t be eating candy, and adults should buy their own candy. Halloween is for kids!” If you want or need to bring your three-month-old with you, go for it, but if the kid can’t walk, they shouldn’t be collecting chocolate. Likewise, if your kid is old enough to drive, send them to the store to get their own candy. Don’t turn your yard into a horror movie. If you want to freak people out, set up a haunted house in your garage so families can choose to go in or stay out. But animatronic headless screaming monsters next to your mailbox can give little kids nightmares. Don’t let kids run to the door and trample the flowerbed in the process. Stay on walkways. It’s safer and makes it less likely your kids will stomp on your neighbor’s asters. Don’t allow your kids to grab the candy bowl, take a handful or ask for something else. Teach your children to be grateful, not greedy, and tell them to take one of whatever’s available unless they’re offered more. P.S. Same deal if there’s a bowl of candy left on the doorstep — limit of one per person, please. Lights off is basically the international symbol for “no candy here.” Either they aren’t home or they want you to think they’re not; either way, don’t waste your (and their) time. Don’t let kids throw candy wrappers anywhere but back into their trick-or-treat bag. No one likes littering — and if kids are old enough to get candy, they’re old enough to throw their own wrappers in the trash at home. Don’t forget to smile — and tell your kids to do the same. Throwing in a “Happy Halloween!” as you walk away doesn’t hurt either. Download the free Q Wunder app to help your kids build a foundation of courtesy and manners — all year long!